The artist is actually a painter by trade. Learned to do tile for this project. Even though the painting looks spontaneous (quick brush strokes, paint drippings) – he actually calculated each stroke by taping off areas and painting over and over them in brilliant color glazes. The process was to cut out cardboard templates to match the size of each shaped tile (allowing for tile shrinkage). The templates were used very much like a dress pattern, placed on slabs of clay, and cut in exact shapes. The tiles were then dried and bisque fired to create a more durable surface to glaze. The tiles were glazed in a manner that makes them look painted. Before the final firing, glazes are very pale. Once fired, they look rich and brilliant. Funded By: Michigan Council for the Arts, Community Foundation of Southeastern Michigan, Michigan Bell (an Ameritech Corporation), City of Detroit, Detroit People Mover Art Commission. 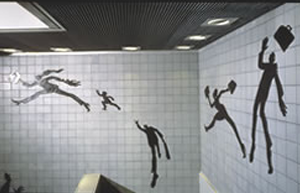 These fourteen humorous figures are running to catch the train. Newman’s cast bronze shapes give the impression of constant movement, reflecting the action of people using the system. The largest figure has a 23-foot span, which visually carries the viewer up the escalator to the platform level.